The idea of Rekha opposite Rajnikanth is just too delicious for words, isn't it? Just imagine the wardrobes! And the eybrow-waggling! And one-liners! And attitudes! Sadly, this combination yielded so little that I turned to imdb to try to figure out what my options were. I found just three films in which they both appear: Bhrashtachar from my earlier post, Phool Bane Angaarey, and Bulandi. From the latter, I found this lovely song. There doesn't appear to be anything crazy about it, and sadly Anil Kapoor appears more than Rajni does, and Rekha and Rajni don't interact significantly in it. 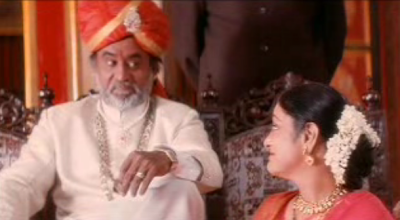 Still, he makes a dashing thakur, and Rekha of course looks gorgeous and dances beautifully. The real star is the architecture - this song could work as a tourism video! Phool Bane Angaarey yielded no clips of them together*, though I found one Rekha song, the festive and colorful "Gore Kabse Hui Jawaan Banna Le Ja Apne Saath"). That left me to scramble for something else from Bhrashtachar. Here's a sufficiently attitude-fueled confrontation between the two. Rekha plays a journalist and Rajni some kind of bad guy - you can tell because only bad guys walk around with briefcases full of bills. 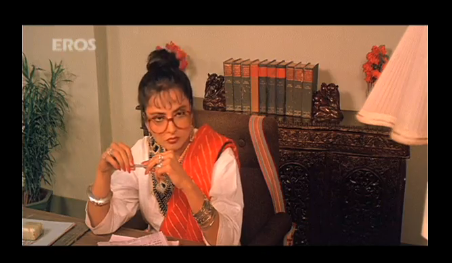 I like how serious Rekha looks with those Who's the Boss? glasses - only smart, feisty women wear those! 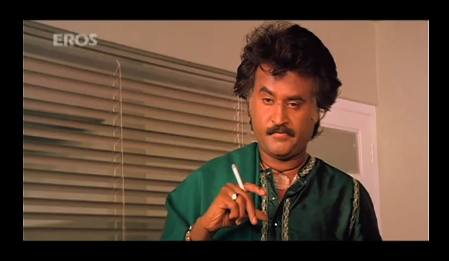 - and how sauntering and flippant Rajni's body language is. I would like nothing more than to be proven wrong and given evidence of a wacktacular Rekha-Rajni song. So those of you who know more about the 80s and 90s Indian films than I do (i.e. about 1/6 the world's population), let's have it! * Update to post (October 7, 2010): Bollywood Deewana sent me this fun song from Phool Bane Angaarey! Clearly my spelunking skills are not up to par. I doubt any such song exists. Rekha and Rajnikant barely appeared together in films. I'd have loved to help you out, but I've seen none of these films. in fact, I'm in love with Rekha of the earley 80s :) She was splendid then. I am far from an expert on Rajni-saar but have to echo what Suresh S says - I've only ever encountered him as playing 2nd or 3rd hero in the few Hindi films I've seen him in. It is kind of weird to see him playing second (or third) fiddle to other stars once you realise he is actually a MEGA STAR in the south.